It’s been far too long since I last wrote. I’m sorry for that, but I am in “off-season”. My next “season will begin later this year. As mentioned before, my goal this summer is to get myself in great shape. I’ve reduced my fast food intake (to just about none), eating portioned meals throughout the day, and staying physically active five days a week. 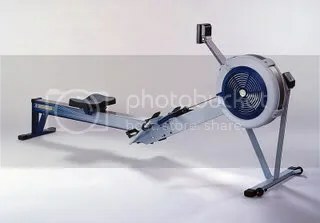 Over the past two-three weeks, I’ve started using the Concept2 rowing machine. This is a machine that will really get you going. It’s a great cross-training workout because it’s low impact and helps build muscle throughout the body. One of my trouble areas is a weak upper body, and this has been helping me build muscle in key areas for my marathons: back, shoulders and arms. Ok before I get into my next topic, I’d like to give you all a short story. When I moved to Los Angeles just over three years ago, I was severely overweight. I’m still overweight, but it’s nowhere near as bad as it was in 2005. I weighed 314 pounds! Today, I am happy (but not yet content) with my current weight of 247! 67 pounds! Gone. I don’t want to see them again. Ever. Having said that, I would like to cut myself down to 210-220. There’s still a long road to go. Why am I blabbing about all this? Well, it’s 104 degrees outside right now and I can’t do much. So I decided to start cleaning out my closets. I dumped three boxes of clothes into my living room and sorted through them. Turns out that 90% of the clothes no longer fit because they are ridiculously large. Pants that are XXL, 44 waist, shirts that are XXL (big big big). Taking these out to the donation center was a bit rough for me. I was saying goodbye to my former self. My clothes. MY clothes. Going through these clothes brought back so many wonderful and painful memories: Clifford’s birthday party, my first job interview in LA, the clothes I wore when I got laid off, and even my favorite shirt. Today is a new day, and tomorrow will be as well. It was just nice to go through these garments, one last time.